In the past, when people spoke of training collars, they really generally were referring to “choke chains.” A choke chain is a metal chain with a sliding ring that is attached to your dog’s nylon or leather leash. And if you think I’m kidding about any of these injuries: I’m not; they’re all well-documented cases taken from hundreds of veterinary practices who have treated the dogs injured by choke chains. Bottom line? In the hands of an experienced trainer, a choke chain can be used appropriately, but for the most part, your average person has no idea what an appropriate use of a choke chain entails. My own personal preference is for a flat buckle collar, either nylon or leather, which can be used for training and everyday use. It should fit snugly, but leave room enough for you to slide two fingers between the collar and your dog’s neck. Any looser than that, and it may slide off over your dog’s head. Any tighter and it may cause chafing and discomfort. The choice of nylon or leather is simply a matter of personal preference – nylon comes in a variety of bright colors, and is a good choice for dogs that spend a lot of time in the water (or mud!) Leather is durable and will absorb oils from your dog’s coat, making it more flexible over time. The width of the collar should be appropriate to your dog’s size. 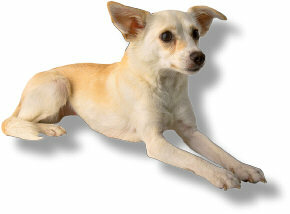 For example, a wide, heavy or thick collar just won’t work on a Chihuahua, in fact, it would look ridiculous. By the same token, if you have a Rottweiler, a diamond- or rhine-stone-studded poodle collar is going to look pretty silly. And don’t forget an identification tag – if your dog is lost or stolen, this is a quick way for authorities to notify you when your pet is located. Another terrific solution is a harness – a device that goes around the neck and ribcage, thus eliminating the possibility of choking. Harnesses are an excellent resolution to the problem of having a large dog that hasn’t been well-trained and pulls or lunges when out for a walk. It’s a great way to restrain the pulling without getting in that choking “tug of war” that you sometimes see. Harnesses are also good for small dogs, which can have serious problems with collars pressing on their small and fragile airways. Now for the proper leash. As with collars, you have a choice of flat nylon or leather (or braided leather is also available), and as with collars, it’s largely a matter of personal preference. I use a 6 foot nylon leash for training my dog. I find it’s the perfect length for walking, heeling and virtually all of my training sessions. Many dog owners prefer a retractable leash. These are nylon leashes that are encased in a plastic casing, and vary in length up to about 25 feet or so. The best models of this type have a one-button “braking” system that stops your dog from going beyond a set distance, as well as a spring mechanism that allows you to adjust just how far you want to extend the lead. Retractable leashes are a good idea if you walk your dog in a variety of settings: you can “reel” him in if you’re on city sidewalks or in situations where there are a lot of people or other dogs around, then you can expand the distance between you when you get to the park or an open space. (c) 2004 by Charlie Lafave, author, "Dog Training Secrets!" Our company is not the author of this article, but has reprinted it here with permission of the author, Charlie Lafave, who is also the author of Dog Training Secrets. Dog Training Secrets is described here. Disclosure: Our company may receive a payment if you purchase this product after following a link from this website.